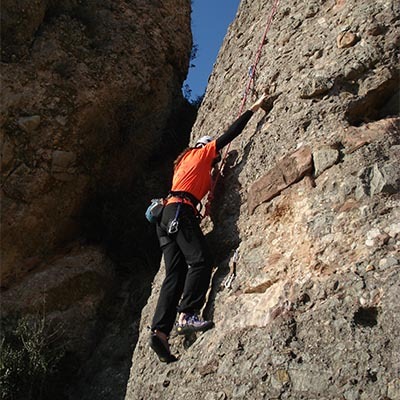 Rock climbing consists of ascending vertical cliffs or very steep slopes using the arms and the legs to advance, with or without the help of equipment. A range of techniques are used to ascend or climb and descend or abseil down mountains and artificial rock walls. Technique and strength are both important in rock climbing but obviously the better the technique, the less strength is required and the longer the distance that can be covered. A good sense of balance is also very important, ensuring every movement and position of the body is stable. *2 guides per 12 participants. Obrint Via is registered (registration number C-123) with the Census for Organisers of Outdoor, Physical and Sporting Activites of the Consell Català de l’Esport - Generalitat de Catalunya.